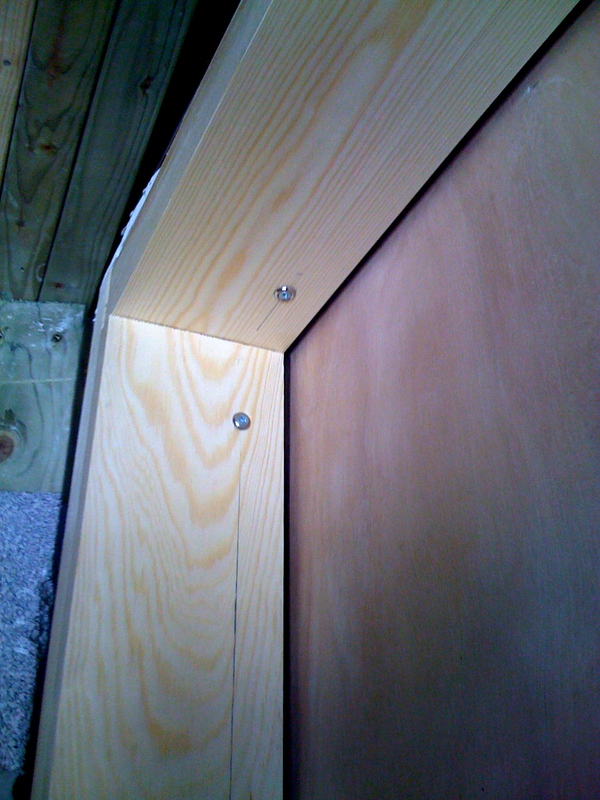 Artis stretches the hessian covering over the MDF frame - in the small area of the frame at the front you can see where the mains sockets will go. 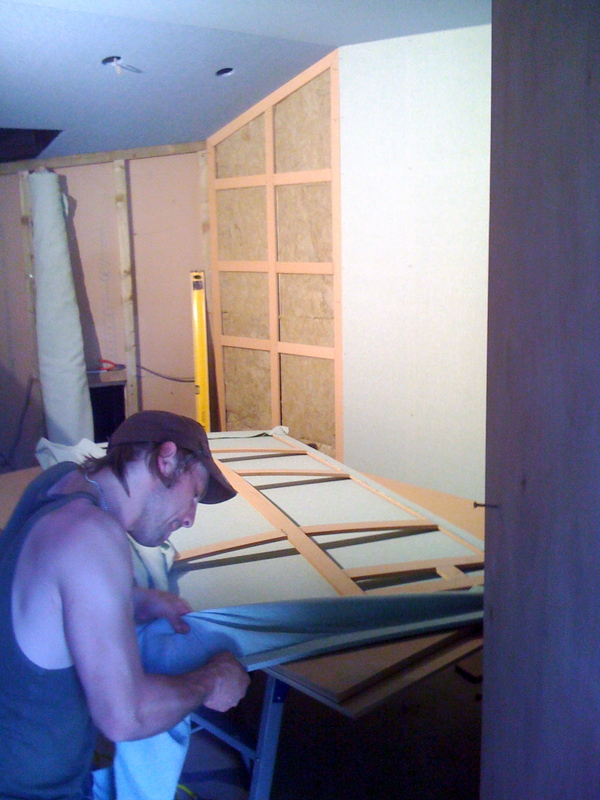 We’re now at day 29; Artis is working on the door seals, and building more hessian frames for the walls. I’ve called BT today and worked out how we can get a phone line in there for broadband – and also got some excellent Ethernet cabling help and advice from Robin, the Comms Analyst at Bath Spa. Those guys really hate Wi-Fi because the signal is so prone to interference and loss of data – and TBH I don’t have much confidence that a Wi-Fi signal will get through all of Jeff and Artis’ rockwool/plasterboard work unscathed, so we’re going to run an Ethernet cable round the building, from the aircon area in the lobby through to the Mac hole in the back of the control room. Artis’ work on the frames is beautiful – each frame is crafted to the shape of a section of wall, so it fits perfectly together with the fabric-width of space in between. 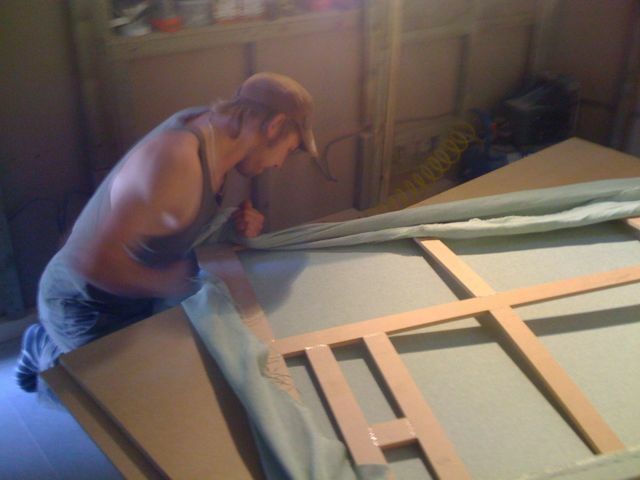 The hessian doesn’t actually touch the rockwool inside each stud wall, being raised 12mm away by the MDF frame. 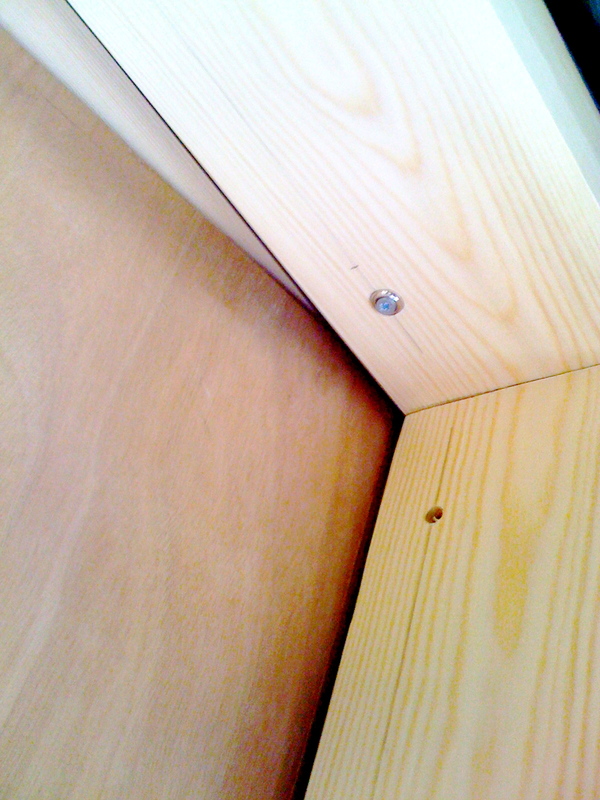 And the carpentry is magnificent, even though it’s just MDF. I learn that back in Latvia, Artis’ carpentry business almost exclusively built beehives! 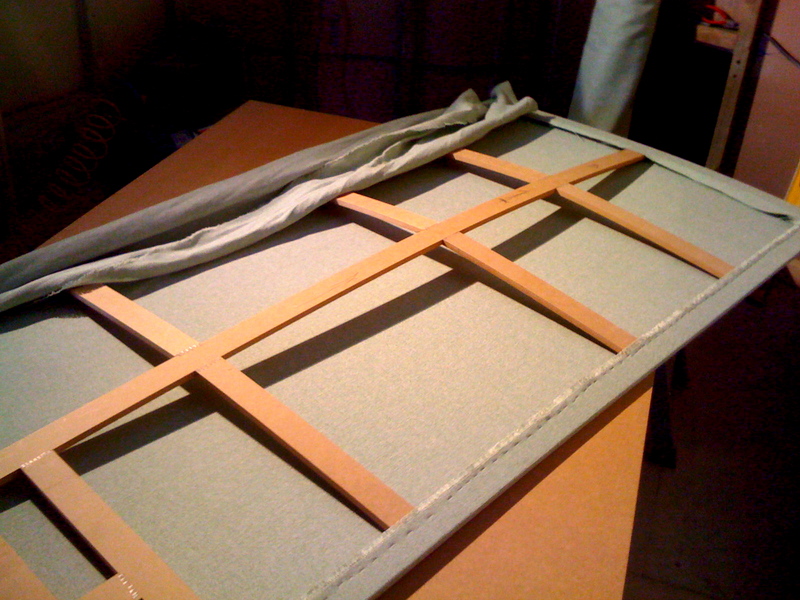 Here are some pics of the hessian frames being constructed, and some more of the door seals. 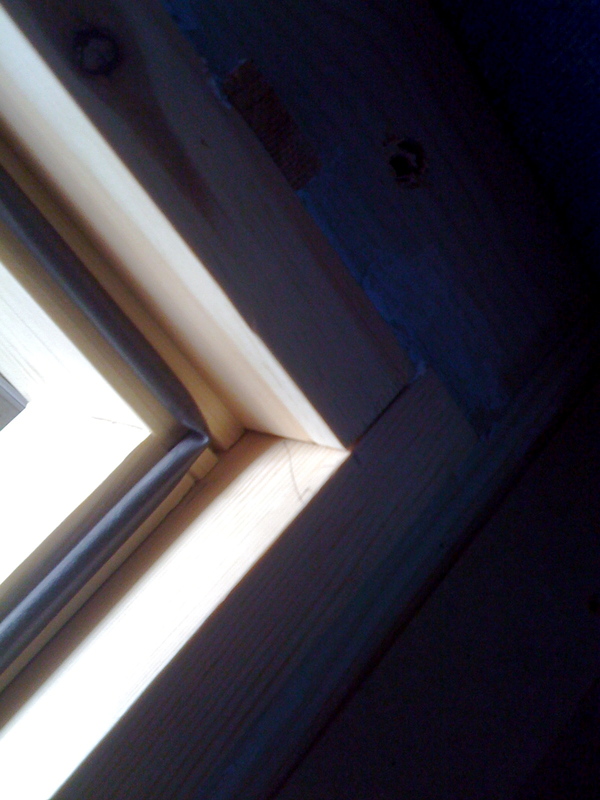 The sealing bead goes right around the frame, including the inside of the hinge area. I’m still learning more about Latvian artists from Artis – recent highlights include Linda Leen (pop/R&B), Brainstorm (pop/rock/electronic), Melo-M (three ‘cellists doing arrangements of cheesy 70s and 80s pop songs), ‘daina‘ (Latvian traditional folk songs) and S’T’A’ (rap/hip-hop). You know which one I’m going to play here, don’t you? !